I am happy to announce the release of FOP 2.20. It has several small features and some big ones. White Label License does not enforce footer or page title. Detects button addition or removals on server reloads, and refresh the web client to update the display, avoiding showing incorrect status because of button number drift. Some global options from preferences.js can be set individually on the preference pane for each user, like notifyduration or language. Fixes disappearing parked calls when doing native sip transfers to the park extension. of keeping only the last recording. 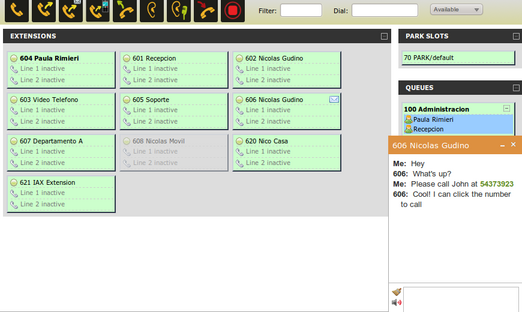 via handset or fop2 voicemail explorer. whisper_options in fop2.cfg, too set the whisper option for chanspy, normally "w", but on newer Asterisk versions you can set it to B to perform a call barge. IM Chat and Voicemail explorer are not included in the standard license nor the free version. An additional license fee of $20 will be charged for each of these features. 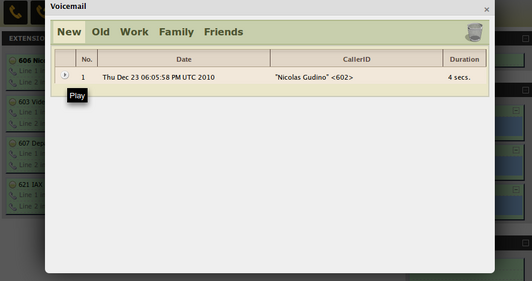 You can listen to voicemail directly from your browser (no need to download the file, it is streamed transparently). You can also drag voicemail to folders or to the trash can. Similar to other web based chat interfaces, it floats on the lower right, lets you chat with other users. It detects numbers and adds a link for click to call, or urls for browsing on new tabs. You can have several chat windows opened, minimeze or restore them, etc. If the user you intend to chat is not logged, you will save what you type as a note that will be popped up to the user when he logs back in to fop2.